To be released in the middle of April, There’s no Tomorrow (SR Records) will focus on Elvis’ August 1973 Vegas season, featuring the midnight show from August 10, 1973, previously unreleased and taken directly from the original high quality tape. The SR attitude is to present Elvis at the peak of his possibility and without any doubt Elvis’ first week in Vegas August season still presents him at the top of his possibilities, delivering great shows. If Rock is an attitude, then the man still has it. The performances are terrific, rough and sharp. Elvis’ tolerance for Vegas has reached its limit in this season and the man will do nothing to hide it. But the beginning of the season is certainly promising and in this show in particular his enthusiasm shines through in every note . Elvis performs all the songs to the maximum of his possibilities, also pushing the band and giving the right time and presenting all the best of his repertoire ranging in all musical genres as only he can do. We are happy to be able to associate great performance with great audio quality in order to be able to obtain a result that you can enjoy too. The ambiance tape is of very good quality, as you can appreciate both Elvis and the band and at the same time you can feel and live the live atmosphere of the intimate Las Vegas Showroom. The show has already said is great, starting from his latest single Steamroller Blues then with autobiographical You Gave a Mountain & My Boy then with the anthem An American Trilogy passing the best single of 1969, Suspicious Minds without forgetting the glorious fifties with Heartbreak Hotel and Mystery Train…. All the songs are very well performed. The Best song We can say I Can’t Stop Loving You: both Elvis and the band are pushing strong with a great job of James Burton guitar. In order to have a special collector’s item, the 400 copies will be presented with FOUR different vinyl color VARIATIONS. All the copies will come with Glossy Sticker hand numbered and individually sealed and Please remember!! This is a LIMITED HAND NUMBERED set of 400 COPIES. As tradition of the label, SR LABEL DECIDED TO PRODUCE TOGETHER THE 400 copies of STANDARD EDITION A LIMITED DELUXE EDITION of 50 copies WITH EXCLUSIVE CONTENTS. 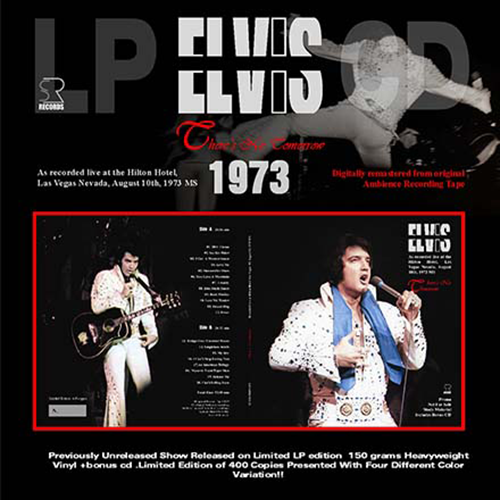 We’re always tryin’ to give more, We hope of this new release will be a real great update of your Elvis’ live show collection.